All four ships in the Fred Olsen fleet will be coming together for a joint historic celebration in Bergen, Norway on Tuesday 28th July. 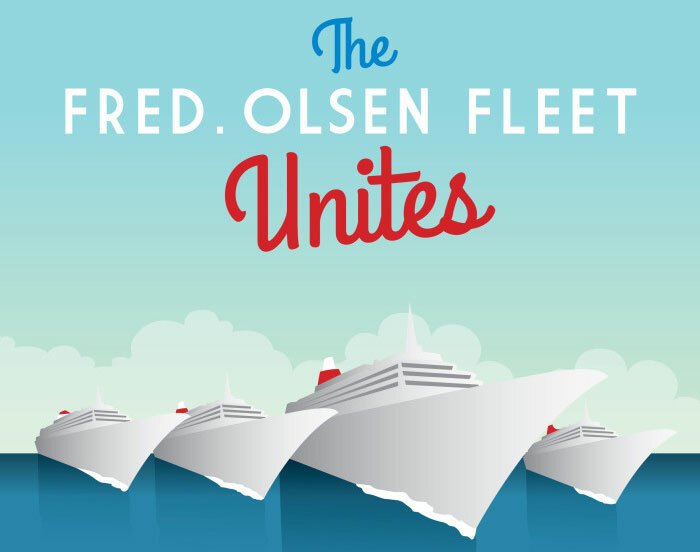 This will be the first time the entire Fred Olsen fleet has met up together and the event will put on a great show for the 4,000 cruise ship guests along with the locals of Bergen which is Norway’s second city. The vent will be called ‘4 Bs in Bergen’ and will be a special occasion due to the cruise line’s roots coming from the country. “At Fred. Olsen, we are committed to the city of Bergen – known as the ‘Gateway to the Fjords’ – on our Norwegian cruise itineraries. The Olsen association with Bergen can be traced a long way back, probably as far as the original Olsen brothers themselves, and we shared in a very successful partnership with Bergen Line during the 1960s and 1970s. Fred Olsen Cruise Lines originated in the small village of Hvitsten, outside Oslo, in 1848, when three Olsen brothers – Fredrik Christian, Petter and Andreas – bought their first ships and began an international shipping company. An action-packed inter-ship ‘Tug of War’ challenge on Festningskaien, as small teams of crew from each ship battle it out, spurred on by vocal support from guests! A spectacular ‘water cannon’ send–off, as all four ships leave the Port in an impressive ‘diamond’ formation. FlagshipBalmoral will depart first, followed by Braemar, Boudicca and Black Watch – all in size order! In 2015, Fred. Olsen will be celebrating a total number of 17 cruise calls for the year, comprising visits by nearly 17,000 guests. Balmoral, Boudicca and Black Watch will be making four calls each, and Braemar will be making five. From Bergen, Balmoral will be continuing to Flåm on 28th July 2015; both Braemar and Black Watch will be meeting up again in Eidfjord; and Boudicca will be continuing to Ålesund.